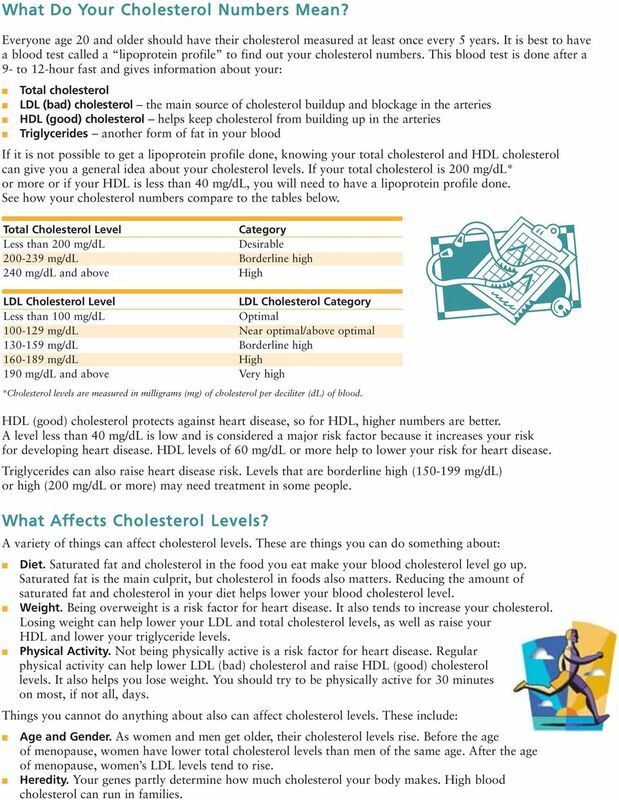 Download "High Blood Cholesterol What you need to know"
2 What Do Your Cholesterol Numbers Mean? Everyone age 20 and older should have their cholesterol measured at least once every 5 years. It is best to have a blood test called a lipoprotein profile to find out your cholesterol numbers. This blood test is done after a 9- to 12-hour fast and gives information about your: Total cholesterol LDL (bad) cholesterol the main source of cholesterol buildup and blockage in the arteries HDL (good) cholesterol helps keep cholesterol from building up in the arteries Triglycerides another form of fat in your blood If it is not possible to get a lipoprotein profile done, knowing your total cholesterol and HDL cholesterol can give you a general idea about your cholesterol levels. If your total cholesterol is 200 mg/dl* or more or if your HDL is less than 40 mg/dl, you will need to have a lipoprotein profile done. 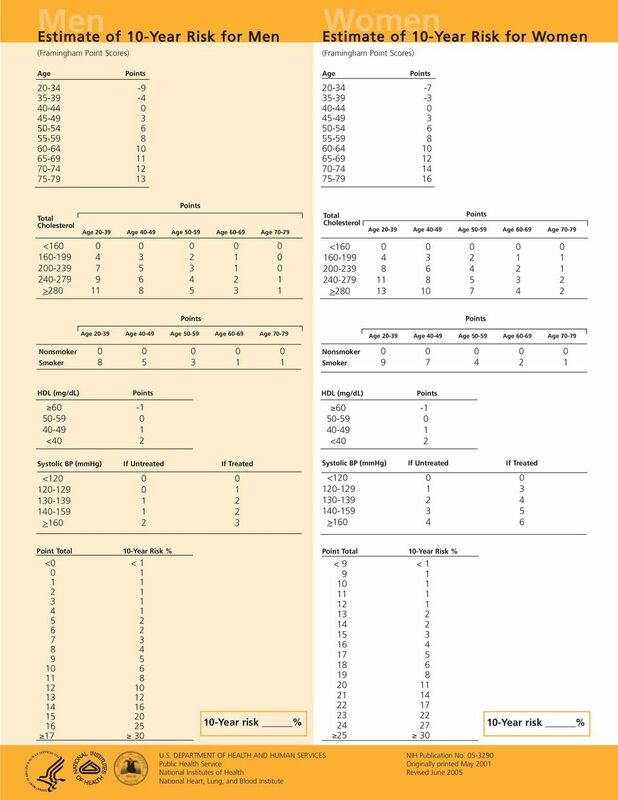 See how your cholesterol numbers compare to the tables below. Total Cholesterol Level Category Less than 200 mg/dl Desirable mg/dl Borderline high 240 mg/dl and above High LDL Cholesterol Level LDL Cholesterol Category Less than 100 mg/dl Optimal mg/dl Near optimal/above optimal mg/dl Borderline high mg/dl High 190 mg/dl and above Very high *Cholesterol levels are measured in milligrams (mg) of cholesterol per deciliter (dl) of blood. HDL (good) cholesterol protects against heart disease, so for HDL, higher numbers are better. A level less than 40 mg/dl is low and is considered a major risk factor because it increases your risk for developing heart disease. HDL levels of 60 mg/dl or more help to lower your risk for heart disease. Triglycerides can also raise heart disease risk. Levels that are borderline high ( mg/dl) or high (200 mg/dl or more) may need treatment in some people. What Affects Cholesterol Levels? A variety of things can affect cholesterol levels. These are things you can do something about: Diet. Saturated fat and cholesterol in the food you eat make your blood cholesterol level go up. Saturated fat is the main culprit, but cholesterol in foods also matters. Reducing the amount of saturated fat and cholesterol in your diet helps lower your blood cholesterol level. Weight. 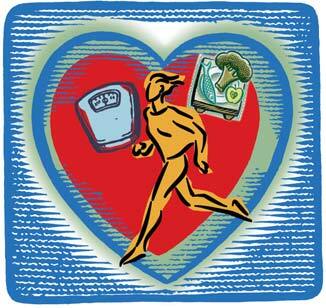 Being overweight is a risk factor for heart disease. It also tends to increase your cholesterol. Losing weight can help lower your LDL and total cholesterol levels, as well as raise your HDL and lower your triglyceride levels. Physical Activity. Not being physically active is a risk factor for heart disease. Regular physical activity can help lower LDL (bad) cholesterol and raise HDL (good) cholesterol levels. It also helps you lose weight. You should try to be physically active for 30 minutes on most, if not all, days. Things you cannot do anything about also can affect cholesterol levels. These include: Age and Gender. As women and men get older, their cholesterol levels rise. Before the age of menopause, women have lower total cholesterol levels than men of the same age. After the age of menopause, women s LDL levels tend to rise. Heredity. Your genes partly determine how much cholesterol your body makes. 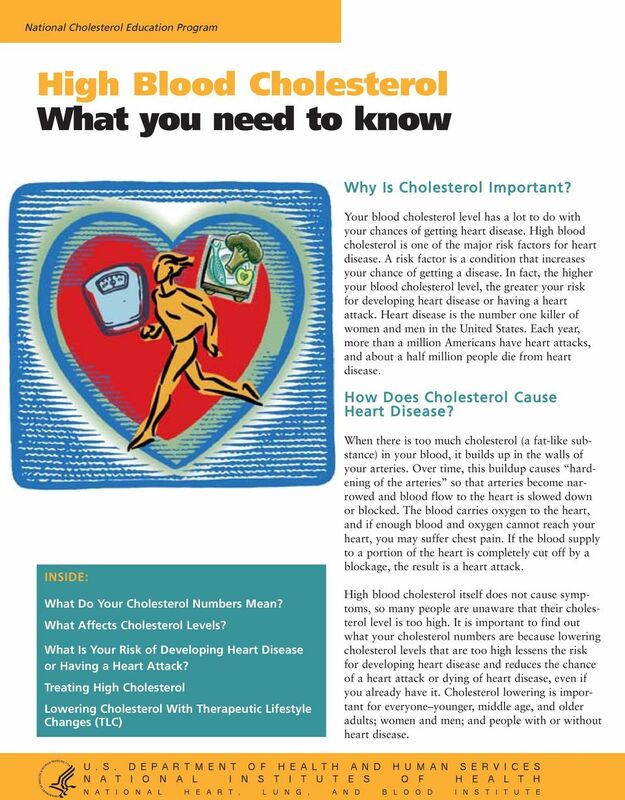 High blood cholesterol can run in families. 3 Step 1 Step 3 What Is Your Risk of Developing Heart Disease or Having a Heart Attack? In general, the higher your LDL level and the more risk factors you have (other than LDL), the greater your chances of developing heart disease or having a heart attack. Some people are at high risk for a heart attack because they already have heart disease. Other people are at high risk for developing heart disease because they have diabetes (which is a strong risk factor) or a combination of risk factors for heart disease. Follow these steps to find out your risk for developing heart disease. Check the table below to see how many of the listed risk factors you have; these are the risk factors that affect your LDL goal. Major Risk Factors That Affect Your LDL Goal Step 2 Cigarette smoking High blood pressure (140/90 mmhg or higher or on blood pressure medication) Low HDL cholesterol (less than 40 mg/dl)* Family history of early heart disease (heart disease in father or brother before age 55; heart disease in mother or sister before age 65) Age (men 45 years or older; women 55 years or older) *If your HDL cholesterol is 60 mg/dl or higher, subtract 1 from your total count. Even though obesity and physical inactivity are not counted in this list, they are conditions that need to be corrected. How many major risk factors do you have? 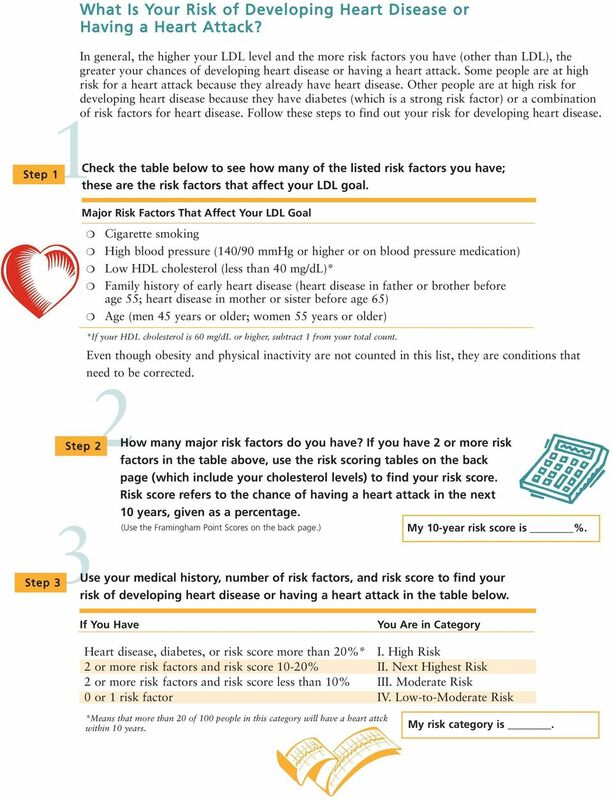 If you have 2 or more risk factors in the table above, use the risk scoring tables on the back page (which include your cholesterol levels) to find your risk score. Risk score refers to the chance of having a heart attack in the next 10 years, given as a percentage. (Use the Framingham Point Scores on the back page.) My 10-year risk score is %. Use your medical history, number of risk factors, and risk score to find your risk of developing heart disease or having a heart attack in the table below. If You Have You Are in Category Heart disease, diabetes, or risk score more than 20%* I. High Risk 2 or more risk factors and risk score 10-20% II. Next Highest Risk 2 or more risk factors and risk score less than 10% III. Moderate Risk 0 or 1 risk factor IV. Low-to-Moderate Risk *Means that more than 20 of 100 people in this category will have a heart attck within 10 years. My risk category is. 4 Treating High Cholesterol The main goal of cholesterol-lowering treatment is to lower your LDL level enough to reduce your risk of developing heart disease or having a heart attack. The higher your risk, the lower your LDL goal will be. To find your LDL goal, see the box for your risk category below. There are two main ways to lower your cholesterol: Therapeutic Lifestyle Changes (TLC) includes a cholesterol-lowering diet (called the TLC diet), physical activity, and weight management. TLC is for anyone whose LDL is above goal. Drug Treatment if cholesterol-lowering drugs are needed, they are used together with TLC treatment to help lower your LDL. If you are in Category I, High Risk, your LDL goal is less than 100 mg/dl. You will need to begin the TLC diet to reduce your high risk even if your LDL is below 100 mg/dl. If your LDL is 100 mg/dl or above, you will need to start drug treatment at the same time as the TLC diet. If your LDL is below 100 mg/dl, you may also need to start drug treatment together with the TLC diet if your doctor finds your risk is very high, for example if you have had a recent heart attack or have both heart disease and diabetes. Category II, Next Highest Risk, your LDL goal is less than 130 mg/dl. If your LDL is 130 mg/dl or above, you will need to begin treatment with the TLC diet. If your LDL is 130 mg/dl or more after 3 months on the TLC diet, you may need drug treatment along with the TLC diet. If your LDL is less than 130 mg/dl, you will need to follow the heart-healthy diet for all Americans, which allows a little more saturated fat and cholesterol than the TLC diet. Category III, Moderate Risk, your LDL goal is less than 130 mg/dl. If your LDL is 130 mg/dl or above, you will need to begin the TLC diet. 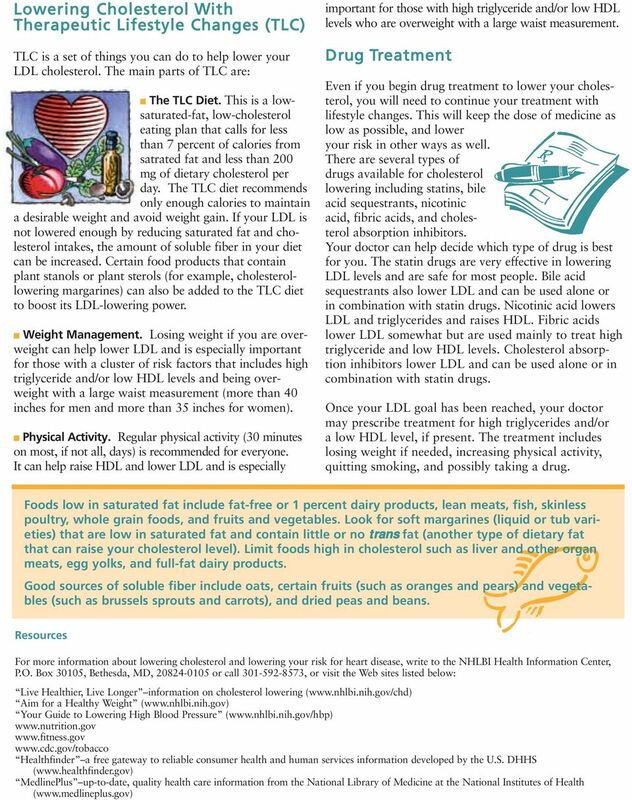 If your LDL is 160 mg/dl or more after you have tried the TLC diet for 3 months, you may need drug treatment along with the TLC diet. If your LDL is less than 130 mg/dl, you will need to follow the heart-healthy diet for all Americans. Category IV, Low-to-Moderate Risk, your LDL goal is less than 160 mg/dl. If your LDL is 160 mg/dl or above, you will need to begin the TLC diet. 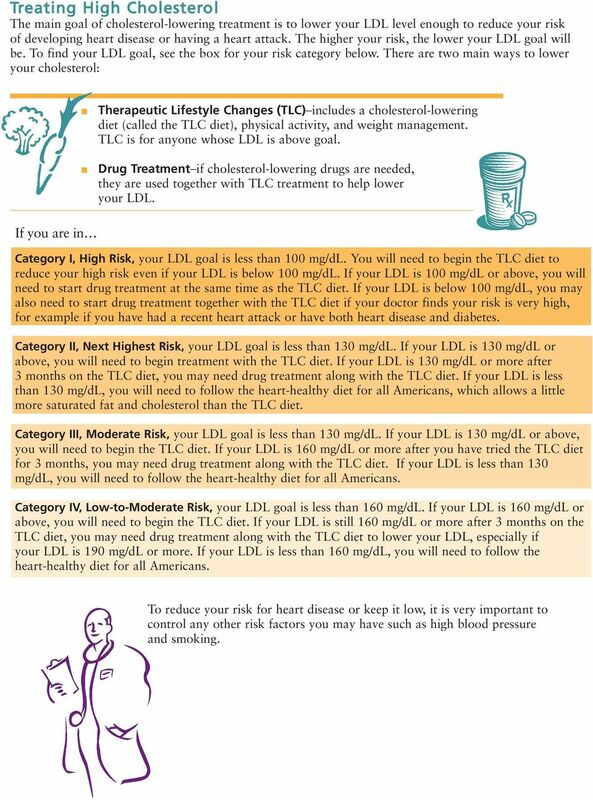 If your LDL is still 160 mg/dl or more after 3 months on the TLC diet, you may need drug treatment along with the TLC diet to lower your LDL, especially if your LDL is 190 mg/dl or more. If your LDL is less than 160 mg/dl, you will need to follow the heart-healthy diet for all Americans. To reduce your risk for heart disease or keep it low, it is very important to control any other risk factors you may have such as high blood pressure and smoking. Diabetes and Stroke Understanding the connection between diabetes and the increased risk of stroke Make the Connection Almost 26 million people in the U.S. roughly 8 percent of the population have diabetes. High Cholesterol Frequently Asked Questions (FAQ) What is Cholesterol? LDL and HDL Cholesterol: What's Bad and What's Good? What Can Cholesterol Do? What is Atherosclerosis? How does atherosclerosis start? Blood clot in atheroma. help make vitamin D and hormones, like oestrogen and testosterone, in your body. Managing your cholesterol Understanding and managing your cholesterol is one of the keys to leading a healthy lifestyle. If your cholesterol is high, you re at a greater risk for heart disease and stroke. The Five-Point Plan Know Your Numbers 2 My husband didn t even know he had diabetes until he had a heart attack. Lupe Ontiveros Actress on Desperate Housewives 13 What does it mean to Know Your Numbers? High Blood Pressure. What Is Blood Pressure? Blood Cholesterol and Heart Disease What is Cholesterol? LDL "Bad" VS HDL "Good" Cholesterol: What s the Difference? Dyslipidemia. Management Strategies for Patients/Clients. Why is it Important to Monitor Your Cholesterol Level? Management Strategies for Patients/Clients What is cholesterol? Cholesterol is a type of lipid or fat that is essential to the body. It plays a role in the manufacture of cells as well as hormone production. Understanding and Managing High Cholesterol and the Importance of Managing Coronary Heart Disease 1 What is Cholesterol? Cholesterol is a soft, waxy, fatlike substance that the body produces naturally. What South Asian Americans need to know about heart disease. Heart disease. Are you at risk? Managing Your With a Healthy Diet Objectives Understand the importance of nutrition to diabetes management Outline current nutrition guidelines for diabetes management Why is Good Nutrition Important?